You may know Croatia for its mezmorising turquoise waters or the medieval walled city of Dubrovnik where The Game of Thrones was filmed. 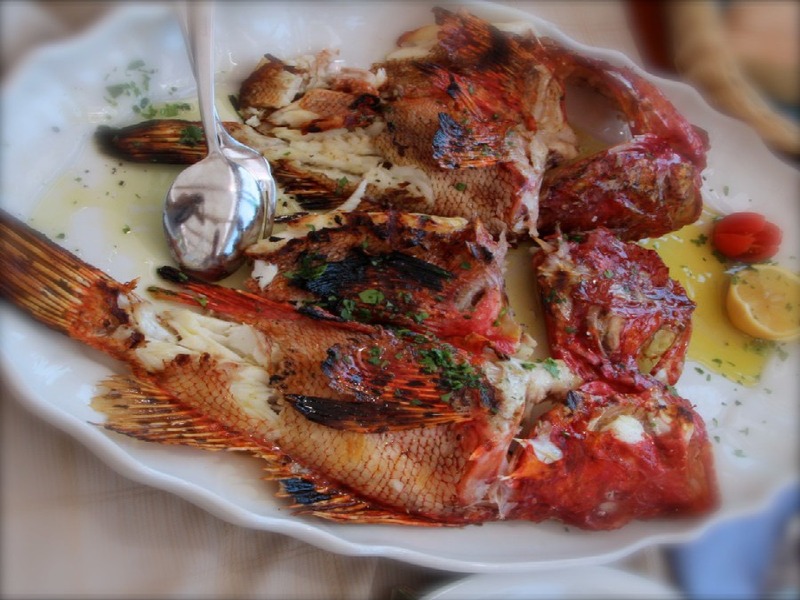 What you may not know is just how tantalizing Croatian food is for your tastebuds. From simple grilled seafood, to tempting pastries, all the way to an ominous black dish that will make you double take, Croatia will have you unbuttoning your trousers to allow for some extra room to try just one more plate….or two. Pick up your knife, fork and spoon and let’s take the foodie tour of Croatia. Travelling to the northern parts of Croatia are a must for those with a sweet tooth. Head to the patisserie for the wiggly-wobbly dish of kremšnite. It will jiggle on your plate like a bobble head dog on a dashboard – but not for long. One bite into your kremšnite and you’ll be scooping the sweetened creamy custard filled centre, along with the crispy pastry, into your mouth in record time. This vanilla and egg custard cream cake has several variations depending on which area of Croatia you are in. They all include a base made of a crispy puff pastry and very rich cooked custard cream, to which whipped egg whites are added for fluffiness. If you are lucky, silky white whipped cream will also be added as a second layer to the cake. If you are super lucky, the puff pastry lid will be topped off with lashings of chocolate icing. Another specialty served mostly in northwestern Croatia is Štrukle, made from very thinly rolled out pastry, over which a mixture of tangy cottage cheese, eggs, and sour cream is spread before the pastry is rolled and cut into 10cm-long pillows. Štrukle are then boiled or baked covered with sour cream sand salt. At first glance you may think Štrukle is a sweet pastry, but as you take a bite and the gooey cream and cheese centre runs down your chin, you’ll discover it’s actually a savoury treat. Good luck stopping at just one. The famous vacation cities of Split and Dubrovnik are located on the coastal part of Croatia known as Dalmatia. It’s along the Dalmatian coast where fisherman haul in tonnes of the finest Mediterranean fish, scampi, mussels, and squid, and pass it along to Dalmatian chefs who will serve your lunch using just two or three ingredients – and always have you drooling. One exception to the less-is-more ingredient rule in Dalmatia is Pašticada, which is a hearty beef dish, traditionally made in Dalmatia. This dish takes over 24 hours to prepare, so is often reserved for special occasions or eaten out. Numerous variants of the dish exist and no chef will ever really give away all of their winning pašticada secrets. In all recipes, the meat is pierced and stuffed with aromatic garlic, onions and bacon, and left overnight in mixture of red wine and water. The oh-so-tender beef is then fried on all sides in olive oil and cooked in a sauce for at least 3 hours. Unusually for Dalmatian cooking, this dish is made up of different spices such as nutmeg, cloves, and dried fruit, producing a rich velvety sauce that you can mop up with fluffy homemade bread. Don’t even think about picking up your backpack and leaving Dalmatia without trying the most unique risotto you’ll ever find. Thanks to the Italian food influences in Croatia, a good risotto can be found on every menu. Look out for Crni rižoto, which is made with diced cuttlefish. 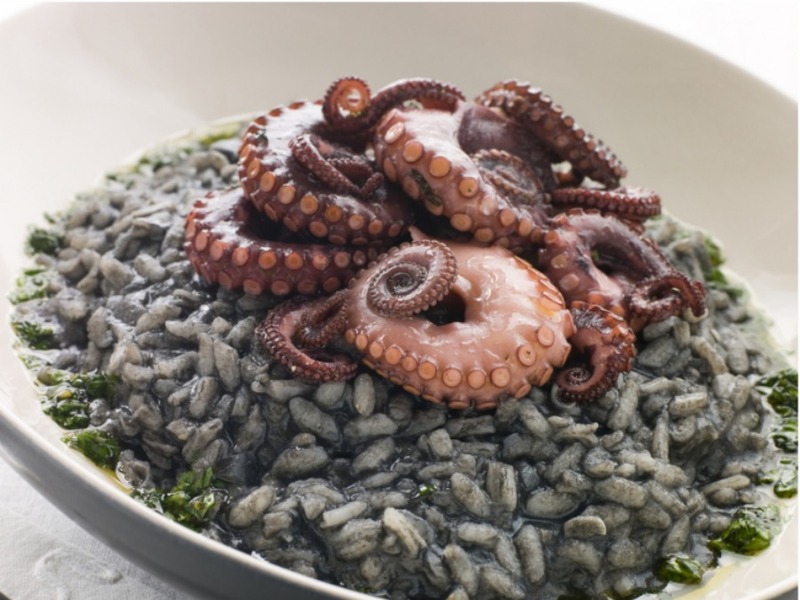 This risotto is the unusual colour of pitch black, dyed by the ink within the cuttlefish pouch, which gives the dish an intense fish flavour. Just be sure not to drop any on your favourite outfit, that stain may never wash out! If you can look past the colour, you’ll no doubt delight in this truly unique-tasting dish. One of the least known parts of Croatia for tourists is Slavonia. However, it is known to all Croatians as it is specially revered for the Slavonski kulin. 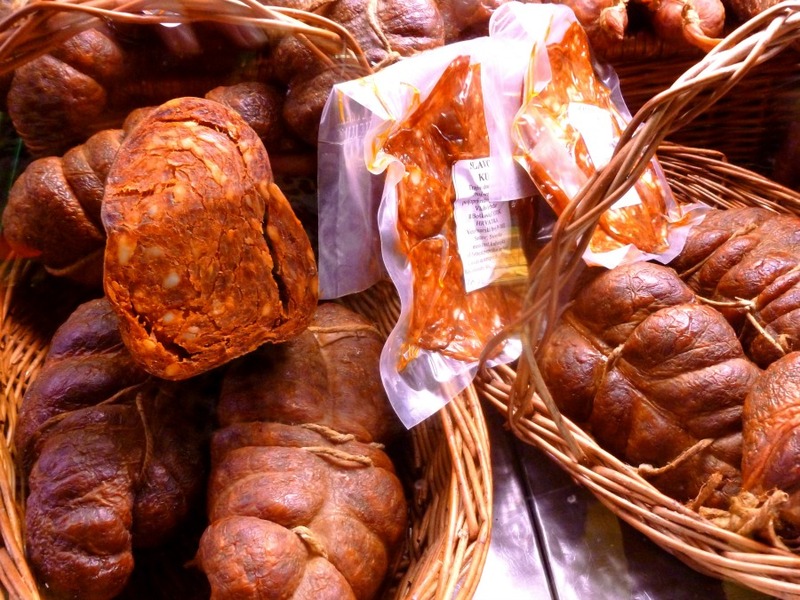 Often shortened to kulen, this is a type of heavily spiced large sausage made from ground pork from enormous black pigs. Along with garlic, heaps of paprika is added to give it both the taste and the distinct red colour. The meat is piped into bags made from pork intestine, giving it a very recognisable shape. Once it is smoked and dried for at least several months, it is then ready to be devoured with cheese and red wine. Plan your trip to Slavonia for the Čobanac festival. This annual event is centred around a competition to cook a soupy stew in oversized bronze pots on an open fire. The Čobanac goulash from which the festival name derives is made from three types of meat; usually pork, beef, and a type of game or horse-meat, which is seasoned with handfuls of hot paprika to give it a real kick. With the extremely fertile land in Slavonia, Croatia’s proximity to the sea in Dalmatia, as well as the result of thousands of years of foreign occupation, there are many influences which make up Croatian cuisine. No matter where you are, Croatians are extremely proud of their gastronomic traditions and they will each tell you that their family recipe is the best. In a way, they’re all right. SJ Begonja: SJ is an Australian expat who lives in a small Croatian village & writes about Croatian food, travel & her experiences as making Croatia home with her family. Chasing the Donkey – A local’s guide to Croatia. The best of food, travel and culture. I can suggest a lamb meat and sheep cheese from Island of Pag. Lamb has specific flavor because of the environment in which lives and feeds autochthonous Pag sheep Pramenka. A variety of medicinal plants grows on the karst, barren rocks: sage, nightingale, miserly, small grass strewed with salty wind, from frequent winter storm. A world gastronomes consider it to be unforgettable delicacy of Pag table. My friend and I are going to visit Croatia at the end of the August. I have a small hope that Italians put their influence not only on the risotto but on the ice cream too. vanilla and egg custard cream cake sounds so tasty. I intend to make it at home. I am a sucker for cakes. Wow the Crni rižoto looks like something out of a Dr Seuss! Great post, it’s making me hungry! Mm look forward to visiting Croatia sometime and trying these dishes! Between one of the 6 traditional dishes, wich i ‘ll prefer to taste is a dishes of fish, if the chance permit me to visit this beautiful country. SJ and Samuel, As you know food is life! And Croatian food is heaven! Love this post! Food in Coratia is really specific. I love how they make sea food. Cheers. Njam! The food looks delicious! Have you tried the Croatian cheese? Good read! I’ve been to Croatia twice now over the past few years and was really impressed with the food. But don’t think I tried all this. Which basically means I will have to go back soon. Hmmm, I am hungry. I think I’ll go and get me some Kulen and bread. Thanks for letting us share our thoughts with your readers. I’m glad I saw this article. We spent a few days in Zagreb, had a rough time finding any restaurants let alone Croatian cuisine-specific ones. I guess next time we’ll need to try the coast for the food. That’s awesome Kalli. I hope you find some great Croatian food the next time you visit.